I eat eggs for dinner pretty regularly. I know some folks consider eggs a breakfast food, and I do love a good Benedict for brunch, but I’ve always been a fan of eggs for dinner. There is something totally relaxed, completely soothing, and inexplicably fun about an eggy supper. I think I probably get my evening egg love from my dad. My dad was never much of a cook. In fact, there were only two things that he knew how to make. One of them was scrambled eggs. He always called it an omelet, but it was very much a scramble. A kitchen sink scramble. With everything from leftover brisket to chopped chicken nuggets. And somehow we loved it. But more often than not, my dad’s “omelets” were not breakfast food. “Omelets” were for nights when mom wasn’t home and he didn’t feel like ordering pizza. These days, I’m not quite as into scrambled eggs with hot dogs. But I am still into using eggs-for-dinner nights to clean out the fridge. Yesterday, my fridge yielded leftover cooked butternut and a half a bulb of fennel. I added in a few potatoes and some onion, and a hash was born. Topped with an over-easy egg, it was sweet, salty, rich and decadent. 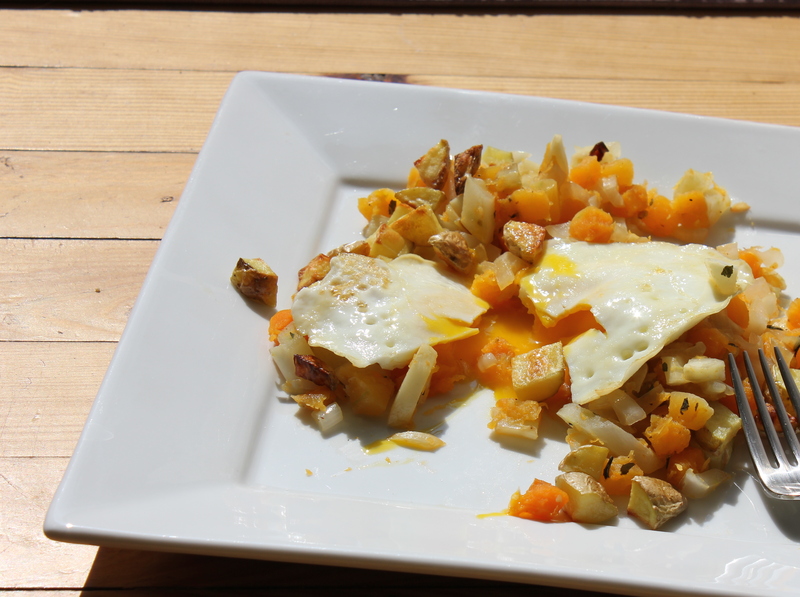 I’m a big fan of the subtle sweetness of the squash with the crispy edges of fried egg. But if you don’t have any winter squash, you could certainly substitute sweet potato or some chopped carrots or parsnips. I quickly steamed the butternut in the microwave, because I like it a bit soft. If you prefer, you can roast it along with the onions and fennel. This is a really flexible hash, so play with flavors that you enjoy. And as for the fried egg, I happen to like a slightly runny yolk. I crack an egg in a hot, greased pan, cook for 2 minutes, then flip and cook for 1 minute more. But egg cookery is very personal, so experiment until you find your perfect method. Preheat the oven to 425 degrees. Put a few tablespoons of water in a large microwavable bowl with the butternut squash. Cook in the microwave on high until the butternut is soft, about 5 minutes. Drain any excess water and return the butternut to the bowl. Meanwhile, toss the potatoes with half of the oil, the herbs, and salt and pepper. Spread the potatoes in a single layer on a baking sheet. Toss the onion and fennel with the remaining oil and more salt and pepper and spread on another baking sheet. Roast both until the potatoes are crisp and the fennel is soft, about 20 minutes. While the vegetables roast, cook the eggs. Heat the butter in a very large skillet over medium heat. Carefully crack the eggs into the skillet and cook until desired doneness. 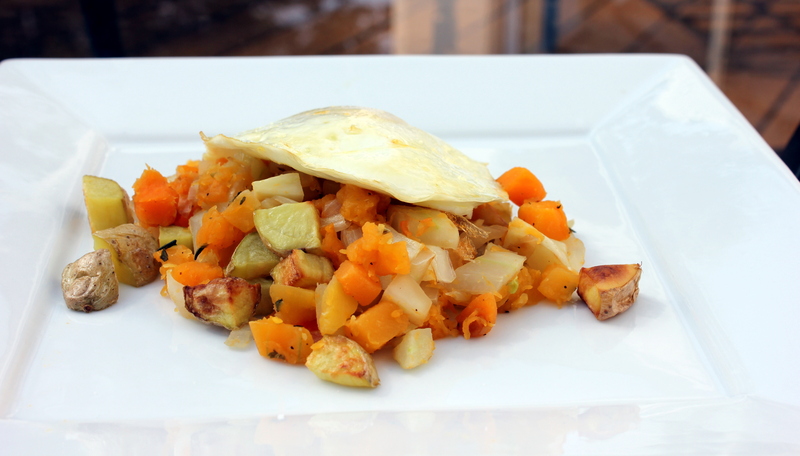 Toss the potatoes, onions and fennel in with the butternut. Divide the butternut mixture onto four plates and top each with an egg, and, if desired, an extra sprinkle of salt. Serve immediately. Remember, back a few months ago, when I made that lovely list of recipes I wanted to try? Well, I promise that I haven’t forgotten. That is not quite true, actually. I have forgotten – over, and over, forgotten to take pictures! This Sriracha Popcorn was gone before I had a chance to snap a photo. And this Apple Butter made a perfect hostess gift. 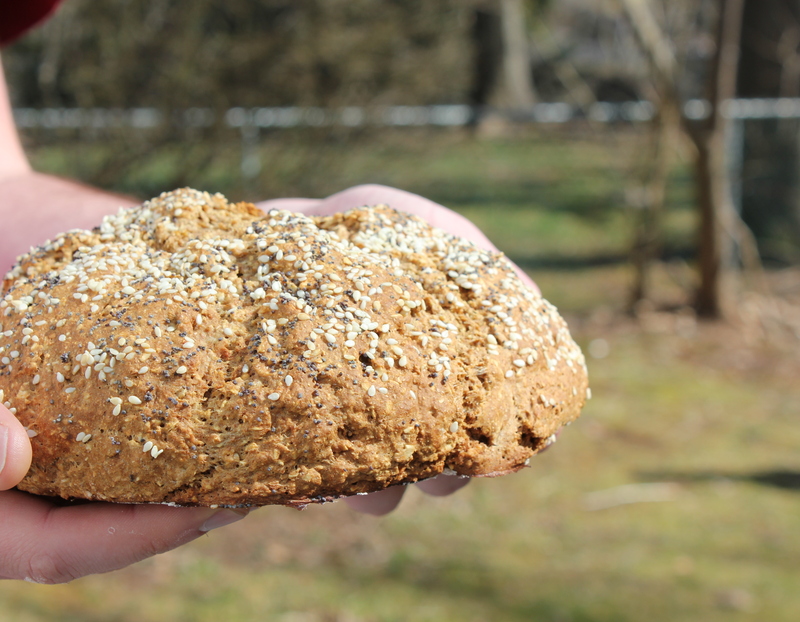 But with Saint Patrick’s Day right around the corner, I was not going to miss the opportunity to show you this hearty oat soda bread. I did have to bar Jeff from entering the kitchen and slap back my own hand as my itchy fingers attempted to tear off just a bite of crust. In the end, though, my camera prevailed. I made a handful of changes to this original recipe from 101 Cookbooks, making a lovely crusty bread deeper and darker. This is not a wimpy bread. It is simple, but it is intense, flavorful, and dense. If you like your bread fluffy and light, this may not be the loaf for you. But if you like homemade bread that bakes up in under an hour, well, you can’t go wrong here. I adore soda bread because it is beyond easy to prepare. No kneading, no waiting, no fussing. And it still makes the house smell like fresh bread. This bread is all crust. Well, not all crust, but enough to satisfy both me and Jeff. We’re the kind of people who fight over the end of a baguette. The seeds here make for a crunchy crust and the free-form round shape of this loaf leaves more of the bread exposed, allowing for the maximum exterior to interior ratio. I like this bread slathered with a good bit of cream cheese. A generous amount of salted butter is fantastic too – or you could be extra decadent and go for both butter and cream cheese, as Jeff does. And while we’re talking about decadence… this bread is wonderful toasted and topped with nutella. All thoughts of gooey chocolatey nutella aside, the bread itself is actually quite healthy. And if you wanted to keep it that way, you could go for a lovely sandwich with some roasted turkey and fresh avocado. But I actually think this bread goes best with a big bowl of rich and meaty stew. The hearty crumb soaks up all the juices and holds up extremely well to dunking. Next weekend I’ll be making a big batch of Irish lamb stew and another loaf of this oat soda bread and toasting with a pint of Guinness! Preheat the oven to 400 degrees. In a food processor, pulse the oats until they form a coarse flour. Stir together the oat flour, whole wheat flour, and all-purpose flour in a large bowl. Stir in the baking soda and salt. Stir the buttermilk into the flour mixture (if using milk and vinegar, stir the vinegar into the milk and allow to sit for at least 5 minutes before stirring into the dough). The mixture should be somewhat sticky, but do your best to gather it into a ball. Turn the dough out on a floured baking sheet and press into a thick round disk. 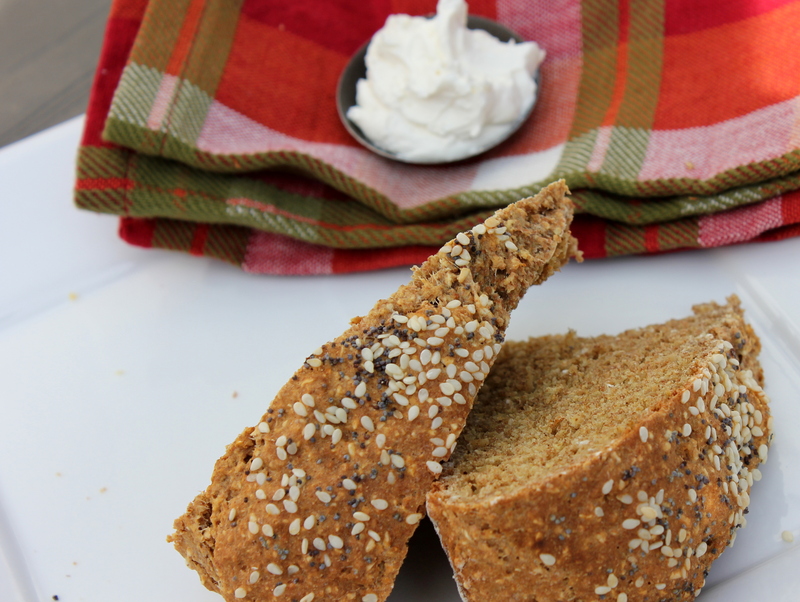 Score the top of the loaf with an X. Brush the dough with a few tablespoons of buttermilk and sprinkle with the seeds. Bake in the middle of the oven for 30 minutes. Move the bread to the top rack of the oven and bake for 20 minutes more to crisp the crust. Wonderful warm with plenty of good quality butter! Why do people say “easy as pie”? Anyone who has ever made a pie knows that this is a truly silly statement. Pie crust is finicky. That doesn’t mean I don’t enjoy the challenge – I like making pie. But I wouldn’t call it “easy”. That’s kind of like saying “easy as yoga”. There is nothing easy about crow pose. What people should say is “easy as fudge”. I always assumed that making fudge had to be a scary, messy process involving candy thermometers and cooling tables. 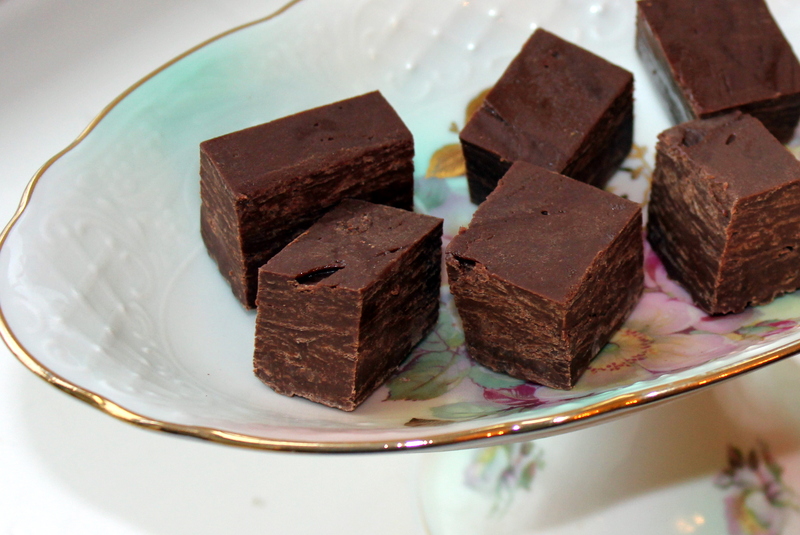 No one told me that four simple ingredients, and about five minutes of effort, could yield delightfully smooth, rich fudge. No one, that is, until my mother-in-law. She makes mountains of this stuff every year at the holidays (I think that Jeff annually consumes at least three or four pounds of fudge between Christmas and New Years). It makes a wonderful holiday gift for anyone from your hairdresser to your great-aunt. 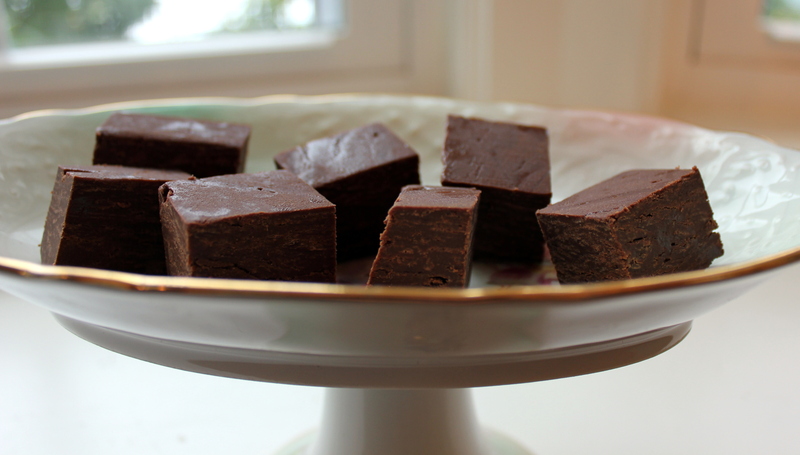 So even though the holidays are long gone, when I was wracking my brain for a homemade housewarming treat to cart down to Texas with me, fudge seemed like the perfect choice. Packed in a little tin, it travels amazingly well. 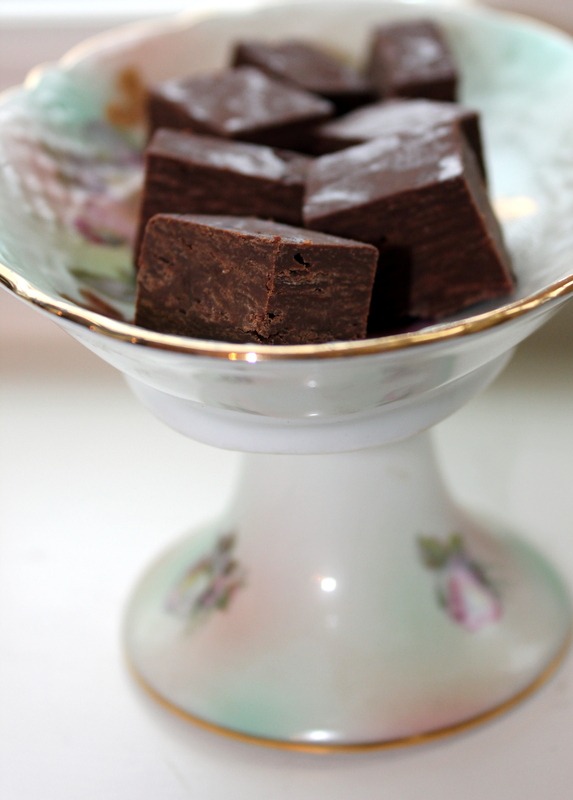 And my chocoholic friend Katie will adore the deep, rich flavor of this intense, dark chocolate fudge. Yes, her name is Katie too. And we both love chocolate. We’re a match made in heaven. So, Katie, if you’re reading this, I guess I spoiled the chocolatey surprise. You’re getting a tin of fudge when you pick me up at the airport tomorrow. I promise you’ll enjoy it even more after a whole night of chocolate anticipation. Now, you probably already knew all about the wonders of quick and easy fudge. But if, like me, you have been in the dark all these years, let me just point out that this is really a base recipe. You can add nuts, dried fruit, or even chopped up candy (think peppermint patties, milky way bars, etc) at the last minute before spreading in the pan. I quite like this plain old dark chocolate version, though. I’ve always liked basic chocolate fudge best. When I was 13 years old my friend Laura and I took the ferry over to Block Island for the day – all by ourselves. And because we had no parents to watch our every move, we bought and ate two pounds of chocolate fudge; one for breakfast and one for dinner. You might think after that day I would detest chocolate fudge, but you’d be wrong. Line an 8×8 inch baking pan with foil. Generously grease the foil and set the pan aside. In a sauce pan over low heat, melt the chocolate, stirring constantly to avoid burning the chocolate (you can do this over a double boiler if you want, but it’s not necessary, as long as you are very careful). As soon as the chocolate melts completely, add the condensed milk and the saltand continue stirring quickly to combine. Cook, stirring, about 1 minute more. Remove from the heat, and stir in the vanilla. Spread the fudge mixture into the prepared pan. Take your time smoothing the top of the fudge. Refrigerate until fully set, at least a few hours, but longer is better. Remove the fudge from the pan, peeling away the foil. Cut into pieces (any size you like) and serve. Keeps refrigerated in an airtight container for up to two weeks.